Call us or fill in our Contact Form online to request a quote for your project. We will promptly get in contact with you to arrange a time to look at your job and discuss your options, taking you through the selection process. 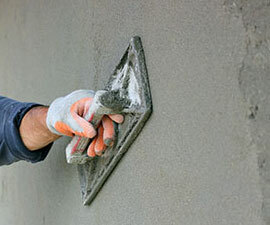 A quote will be provided and once you approve your quote, we will book your job in. Our Render-vations team will ensure that all flooring, fixtures and surrounding areas will be protected and left clean and undamaged from the cement render process, using masking and drop sheets before work even begins. External angles will be applied to all external corners. These provide the benefit of added protection to the corners and a really neat and tidy finish. Certain finishes such as some of our Pro-Series may not require the application of external angles, depending on the job. For example, an internal feature wall would not require this step. Once the job has been prepared and external angles applied, it’s time to get your chosen render finish on the wall. All jobs are different and our skilled master tradesmen will apply your render finish to the highest standard and of the best quality. You can be assured of our quality workmanship and a job you will be proud of! Clean up is important to us! Once the job is done, we will ensure that your premises are left neat and tidy. All masking, dropsheets and rubbish will be removed from site. Like us on Facebook, email us a testimonial or rate us on Google…we appreciate and value our client’s feedback. Thank you for choosing Render-vations!